‘Never before have so many people across the planet been on the move’. This kind of general statement frequently pops up in the media as well as in academic texts. As a concept-metaphor, mobility captures the common impression that our life-world is in constant flux, with not only people, but also cultures, objects, capital, businesses, services, diseases, media, images, information and ideas circulating across (and even beyond) the planet. 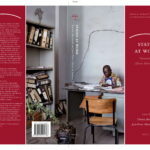 The scholarly literature is replete with metaphorical conceptualizations attempting to describe (perceived) altered spatial and temporal movements. 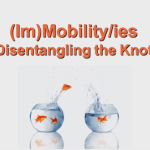 In this talk, I argue that it is important to identify not only various forms of mobility but also the (re)production of socio-culturally shared meanings through diverse discourses as well as practices of movement. Any narrative and experience of mobility is inevitably value-laden. Distinctions are made, which ultimately feed back into the production of the social through culturally inflected notions of what ‘mobility’ means. The currently dominant mobility discourse in Europe, for instance, equates geographical movement with social fluidity, but only for socio-cultural insiders. The recent influx in Europe of ‘outsiders’ is interpreted quite differently. 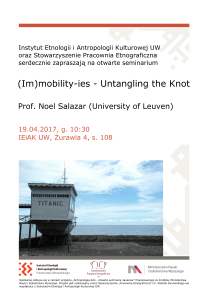 In this talk, then, I illustrate the dialectic relation between ideologies of (im)mobility and actual practices of people ‘on the move’, with examples from various geographic regions and time periods. 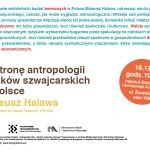 Zadanie „Antropologia dziś – otwarte seminaria naukowe” finansowane jest w ramach umowy 903/1/P-DUN/2016 ze środków Ministra Nauki i Szkolnictwa Wyższego przeznaczonych na działalność upowszechniającą naukę. Projekt jest realizowany przez Stowarzyszenie Pracownia Etnograficzna im. 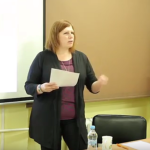 Witolda Dynowskiego we współpracy z Instytutem Etnologii i Antropologii Kulturowej UW.